Some of you may have been wondering, "Why hasn't Tim posted anything here in a while?" 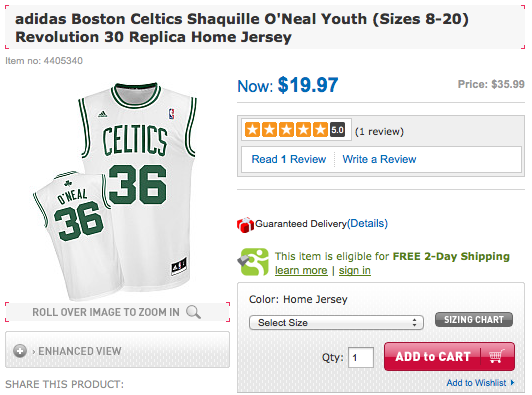 Well, this is why: The Basketball Uniform Database. Over the past few weeks and months, I've been working on something big. 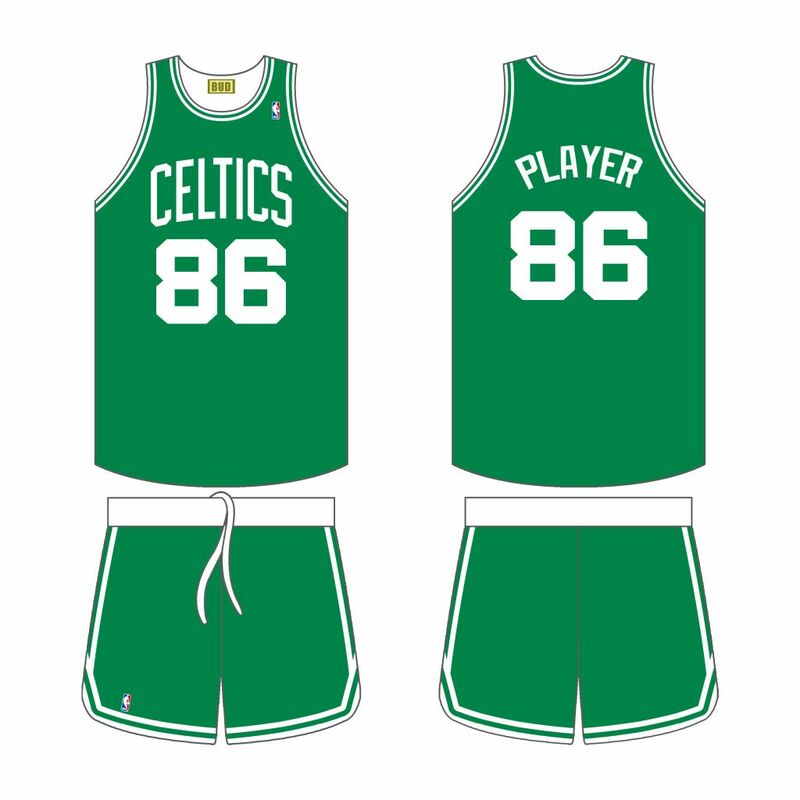 I volunteered to to work with some of my fellow uni-nerds on creating a database of NBA uniforms. The goal is to go back to the '40s but as of today, our coming out party, we have 2011-2012 finished and are beginning to work our way backward in time. In my position as the graphic designer, it has been my job to create the templates, recreate the jerseys and do anything else graphically I can for the project. I've been working with tons of images, logos and color swatches to try and come up with as accurate a depiction of NBA jerseys as I can, no matter if it's the '60s, '80s or the tweens. Now, I'm not perfect (though I'm damn close...). That being the case, if you ever see something on there that's a glaring error, feel free to drop me an email (See: sidebar) and let me know. 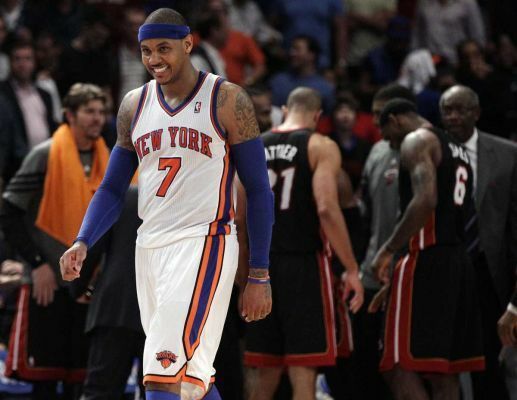 And it turns out, NBA uniforms aren't perfect either. 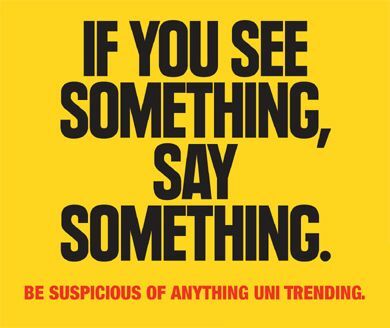 In my personal research I've discovered two bizarre uni-quirks that I haven't seen mentioned anywhere else (though, perhaps I just haven't looked hard enough...). Let's start off with the quick one. 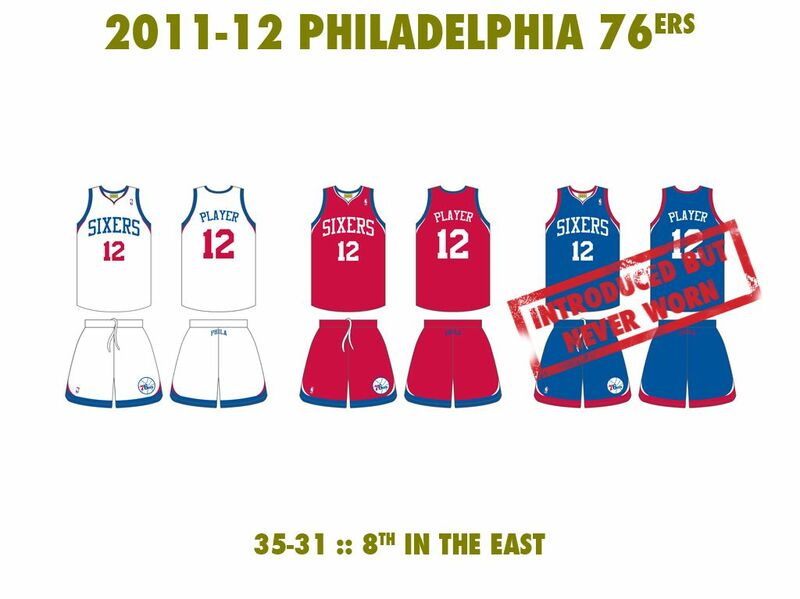 Philadelphia, before this season, introduced a brand new alternate uniform. 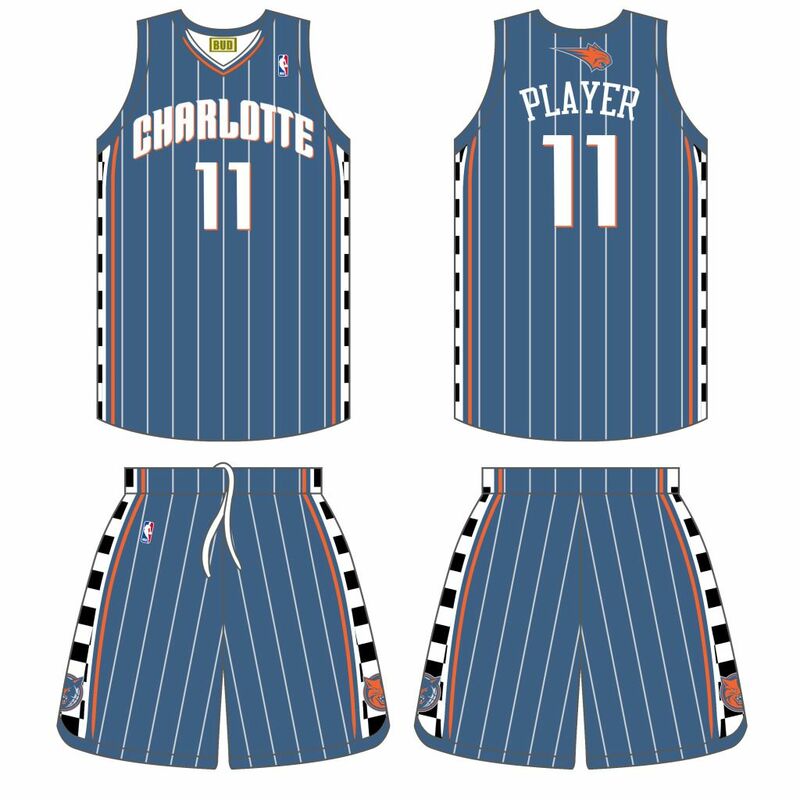 It was pretty standard fair, a blue version of their current jersey template. Not bad. Not great, but not bad. 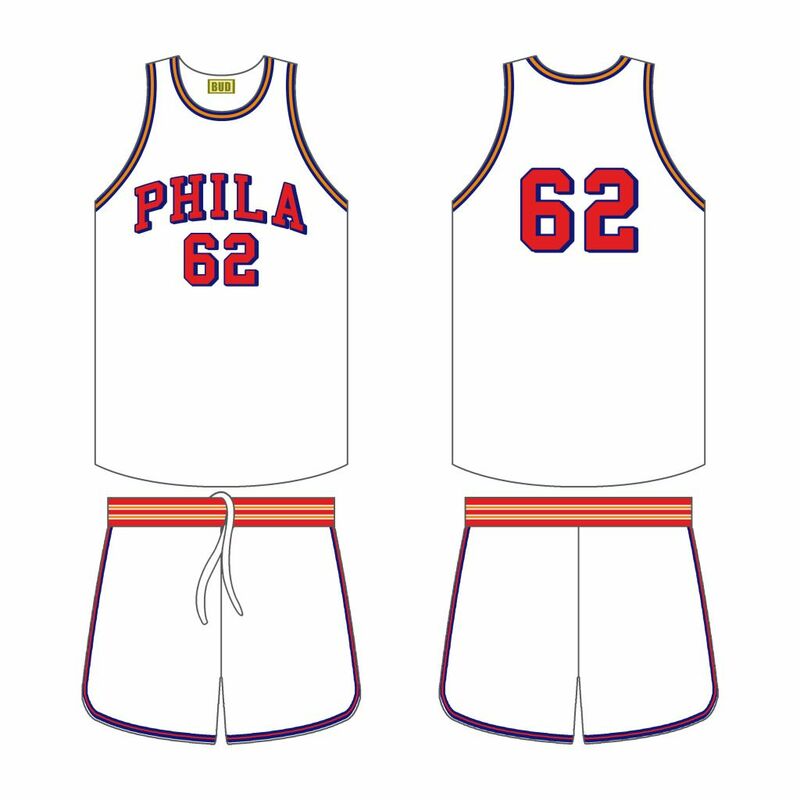 Unfortunately, Philadelphia never wore it. You can do - as I did - and go through all of daylife's 76ers images, it doesn't appear once. Or you can go to their team website and watch game recaps. No sight of it. Or go to ESPN. I think you know what you'll find. It's truly bizarre. 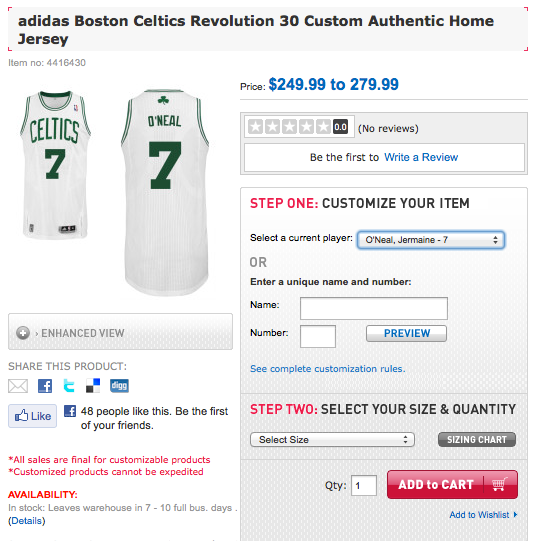 The Sixers don't even sell the jersey in their online store. 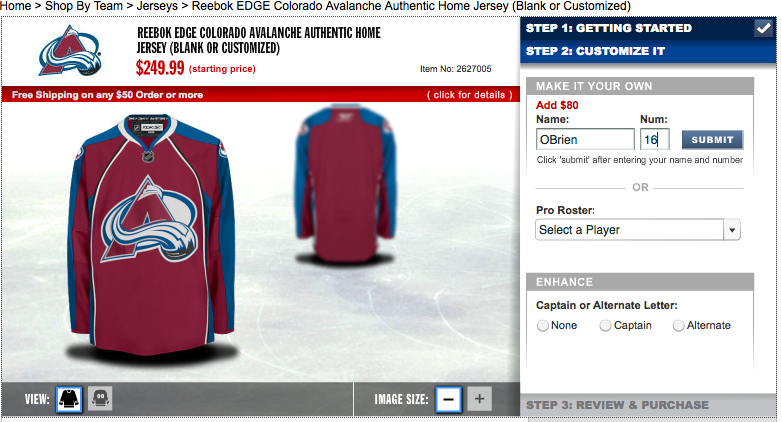 What makes it even more bizarre is that fans seem to love the blue jersey. So the phantom alt of Philadelphia remains a uni-mystery. Who killed it? Why was it killed? Will it ever make it on court? We may never know. Finally, we come to a case of, "Wait, why wouldn't they just change that?" 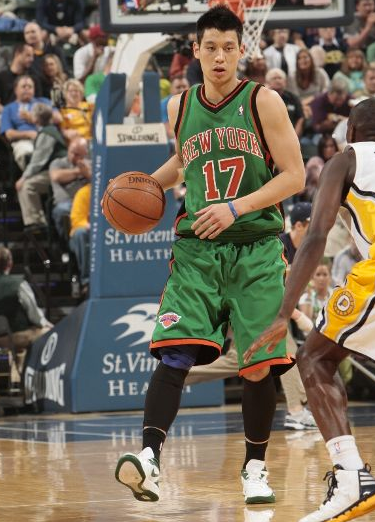 The New York Knickerbockers broke out new unis - their current unis - for the 2001-2002 season. 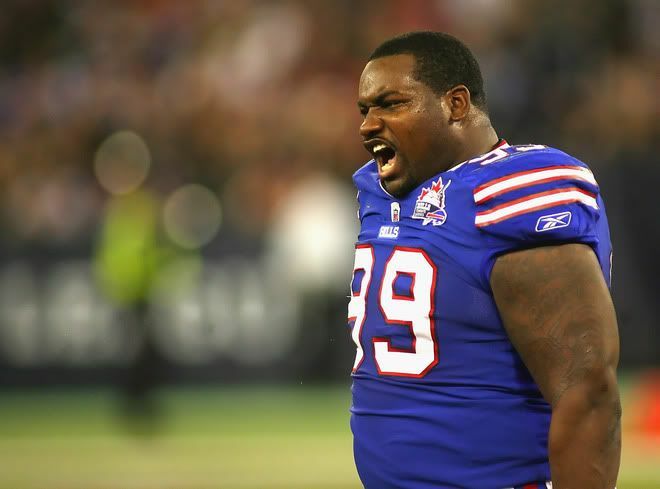 Other than a collar change, the uniforms have remained unchanged for more than a decade. 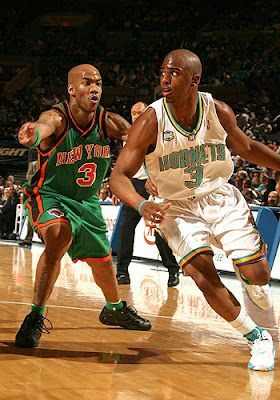 Look at these pictures from the Stephon Marbury era of the nicks: Home Road and St. Paddy's Alt. 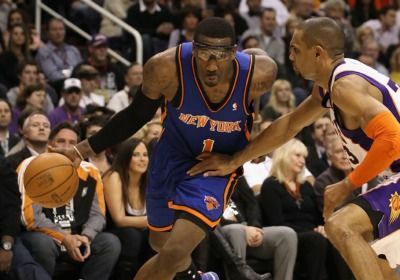 See how the Knicks logo on the shorts is on the right short leg, placing the NBA logo on the left pant leg? 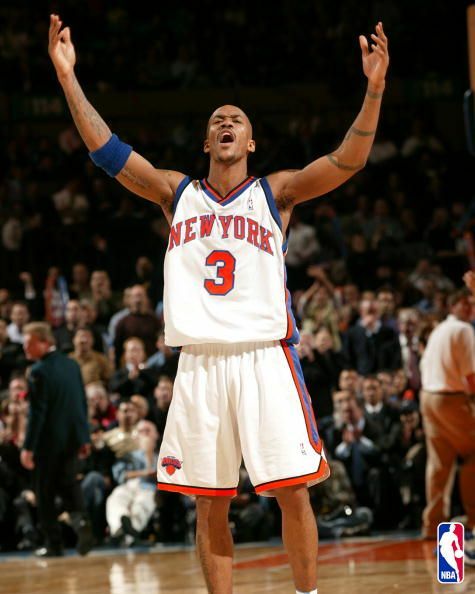 Well, at some point during the Starbury era, the Knicks switched their logo to the left leg (where it remains today). Except on the St. Paddy's Day alts. 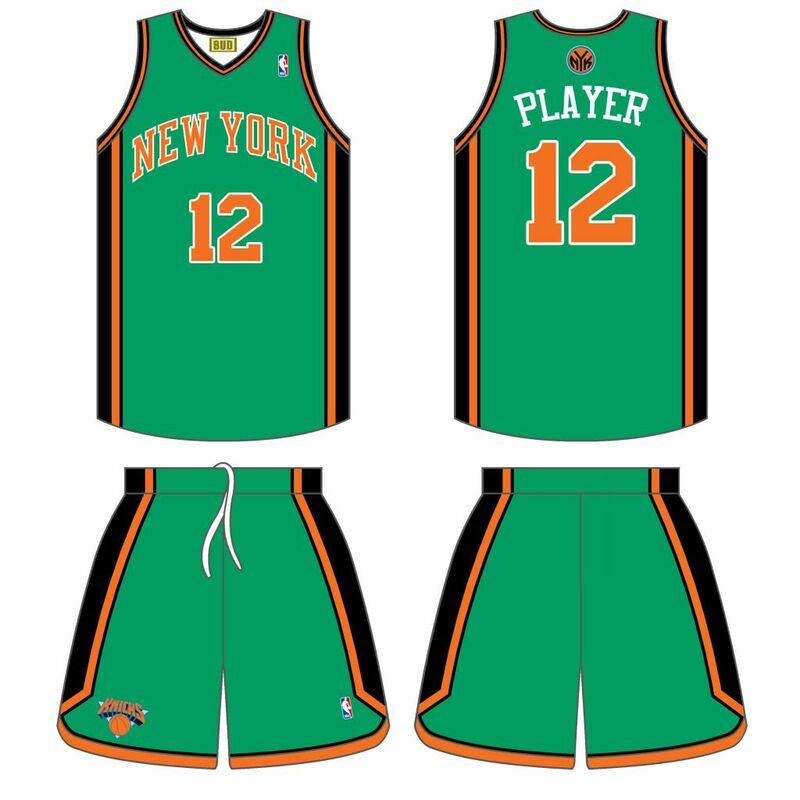 For some reason, the Knicks have never switched the shorts patch on their green alternates. Never. It's very bizarre. 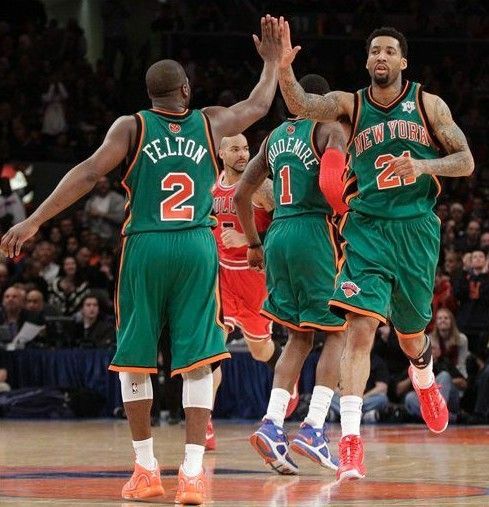 The Knicks changed the logo location years ago, so it's not like these are jerseys created before the change and they just never got around to it. 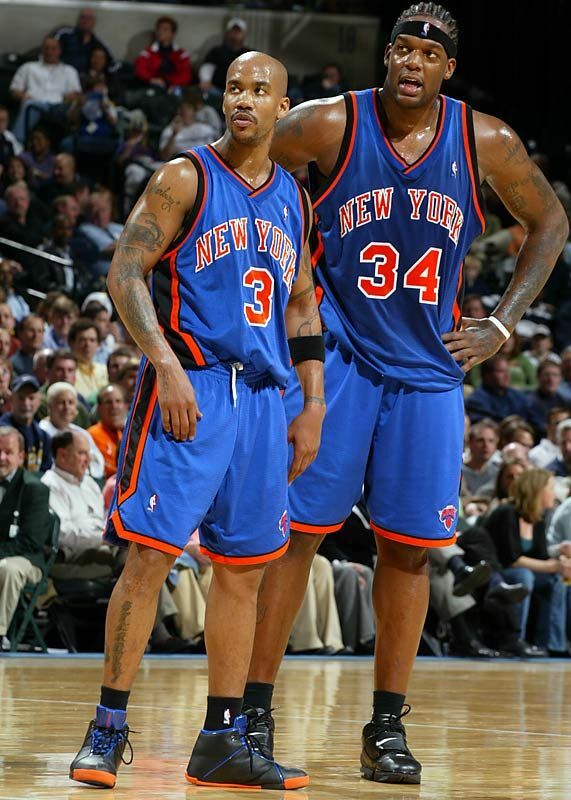 The materials and cuts of the jerseys have changed over the years and most - if not all - of the current players on the Knicks roster have never worn the old home and road unis with the logo on the right pant leg. 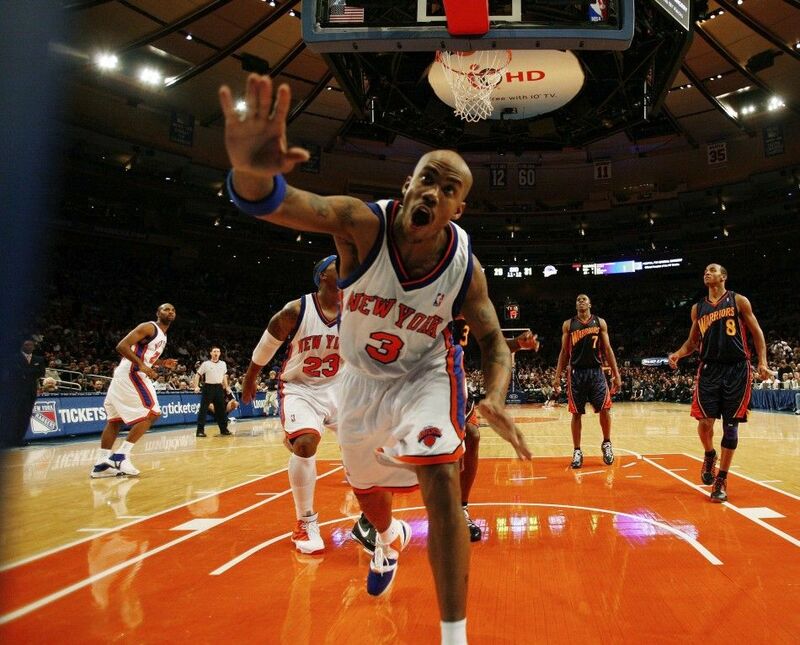 It doesn't matter the occasion (Christmas, St. Patrick's Day, dunk contests, etc. ), the patch is on the other pant leg. It's a very strange uni quirk that I would love to hear the rationale behind. Though, I suspect the the explanation will be less than satisfactory. "It's just a logo on a uniform, who cares?" Most people don't even notice my struggle. Most people probably wouldn't even consider it a problem. Most people probably think this much ado about nothing, but I consider it a slight on my humanity. I am an ApOstracized American. Being ApOstracized is not a choice, I was born this way, but the government doesn't see it that way. Hell, pop culture doesn't even see it that way. 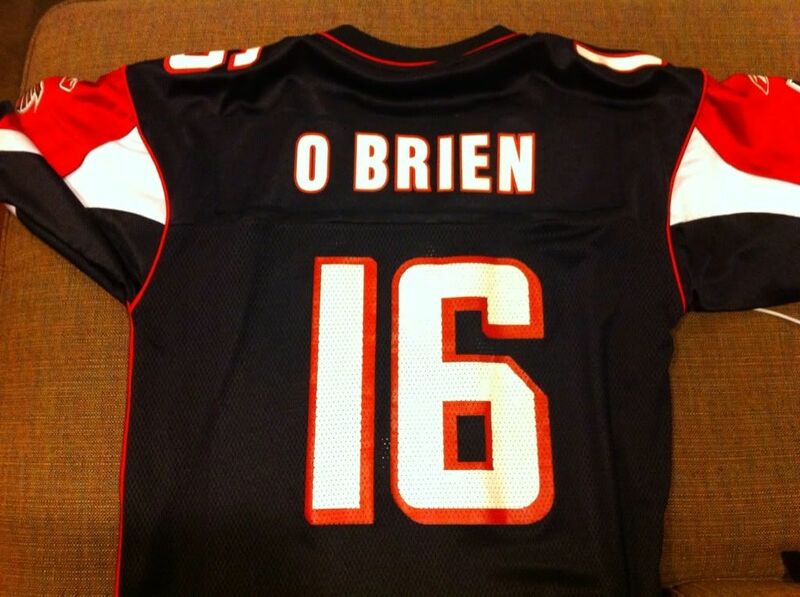 Born an "O'Brien", I have long suffered the indignity of people getting my name wrong. On government forms I'm either "OBrien", "O Brien" or the infuriating "Obrien" - assuming they didn't spell my name with an "a". I was introduced to these injustices at an early age, where they first tried to disenfranchise my people of our proper name. Standardized tests are a cause of anxiety for many young children, but for me - and people of my ilk - they were also a cause of oppression. The oft misused apostrophe, a dominant and important feature of my surname, was often cast aside by anti-apostrophe bigots. I remember taking my first standardized test and while given instructions to fill in the circles in the name box, "Last name, then first leaving a space between them. Then fill in the corresponding bubbles." I immediately noticed that I did not fit into this perfect little circle. I was the proverbial pencil mark outside the line. Patiently, I raised my hand and waited for Mrs. Carrol to call on me. 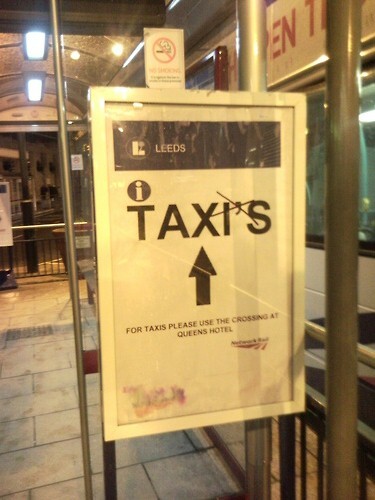 Obviously there was some mistake - I didn't see an apostrophe bubble anywhere. I mean, I had an older brother and sister and I knew other apostrophe families, surely someone had to have a protocol for me and my people. Maybe they just forgot to give me the right form. "Mrs. Carrol, what do I do since I have an apostrophe?" The question hushed the otherwise precocious class. Quietly, my teacher - my authority figure - looked around, perplexed. Finally, after meeting eyes with her teacher's assistant and shrugging, she told me to just separate the "O" and the "B" with a space. A thousand questions raced through my head. Would the machine think I was named Brien O? 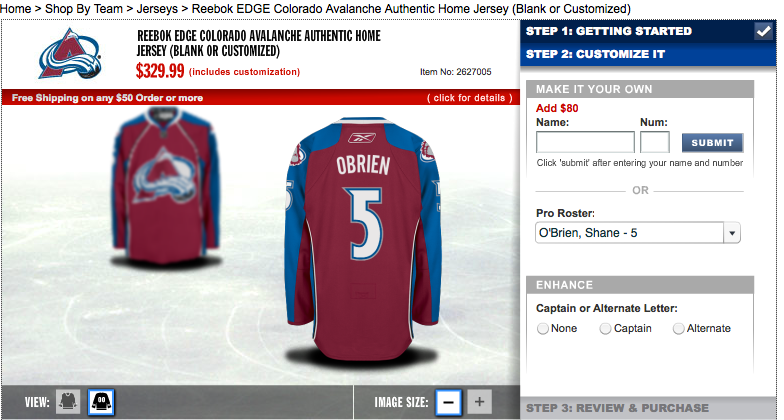 Could I live as a boy named Brien O? Could we bring this error to the attention of someone with greater knowledge of this situation? I learned early in life, separate is not equal. No one validated my apostrophe, and by third grade I was done asking what to do. I had become docile, acquiescent. But as I grew older, I grew bolder. Proud of my name, I would fill in the "space" bubble but defiantly write the apostrophe in the box above it. Take that society. As my passion for sports evolved as I grew, I decided to partake in sports, sports video games and bought much sports paraphernalia. Fortunately, I only played sports for teams that went NNOB. However, sports games like Madden or NBA2K refused to allow the apostrophe in my name in their game. No league, even those like the NBA, NHL or FIFA that have players with apostrophes already in the game, would allow me to Create-A-Player with my distinguishing feature. The bigotry stung like salt in a wound; I couldn't be Tim O'Brien but I could be Tîm ÒBríèñ. Why wouldn't EA or SEGA allow me to be who I am? 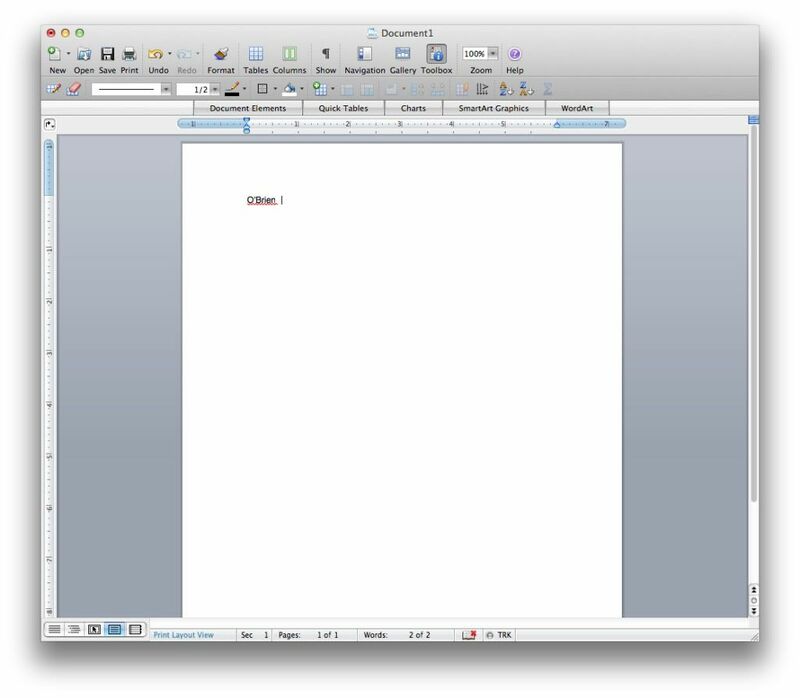 I wanted to write them letters, but Microsoft Word told me my name was spelled wrong. Even my fandom was called into question. For my 16th birthday, my golden birthday, I wanted a White Sox alternate jersey with my name and my favorite number, 16. I had tried this once before. The NFL would not tolerate my people. A miracle happened that summer, my family found a sports paraphernalia store owner who would - without consulting MLB - place my apostrophe onto an authentic White Sox jersey. And thus my wish was granted. I have since become more accepting of my lot in life and tolerate the bigotry I deal with on a near daily basis (mail doesn't get delivered on Sundays). But to this day, four out of the five major US sports leagues do not recognize the rights of ApOstracized Americans. 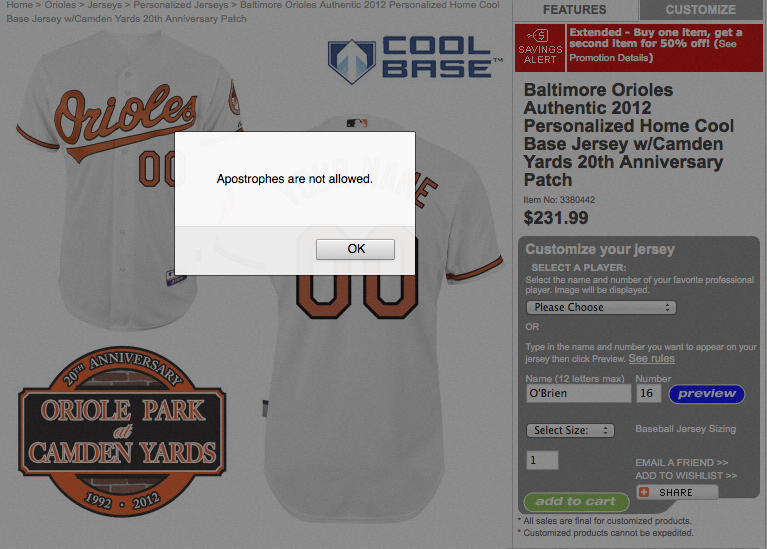 Major League Baseball's response to an apostrophe: "Not allowed." National Football League's response to an apostrophe: "Not allowed." 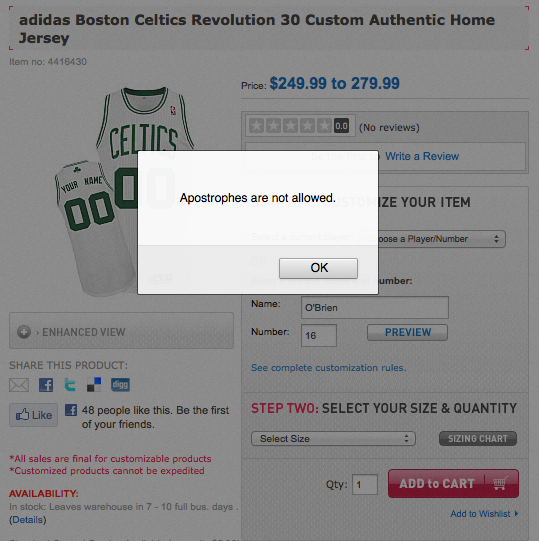 The National Basketball Association's response to an apostrophe is also, "Not allowed," but their stance softens for player specific jerseys or if you select a current apostrophe-having player. The National Hockey League - even on teams with three completely different ApOstracized players - refuses to grant our right to exist. 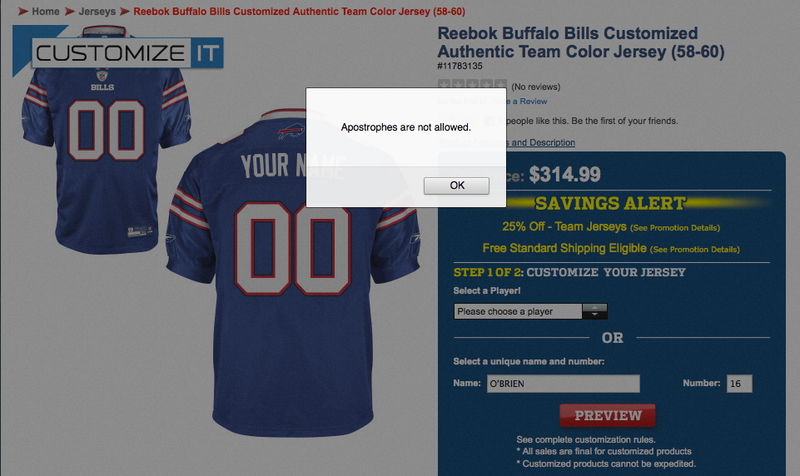 In fact, their box wont even let you type in the apostrophe while are charging you $80 for the right to not do so. Only lowly Major League Soccer will allow everyone their right to an apostrophe, though I'll believe it when I see it. But I dream of a day, when I will not be judged by the punctuation in my name, but content of my of my character. We're here, we're clear, we want to see our apostrophe. As an American, I look down on you with the loving contempt of an older brother. No matter what you do, no matter how well you do it, I'll always consider myself far superior. And the worst part is, it's kinda your fault. Canada tries so hard to make a name for itself and establish an identity independent from the US, but it does so in a way that always screams, "See? We're not America!" And that's never the right way to go about creating an identity. One of the most ubiquitous and obnoxious ways Canadians try to establish this self-image in sports is to wantonly slap a red maple leaf onto any identity they can, regardless of color scheme, team name or club history. 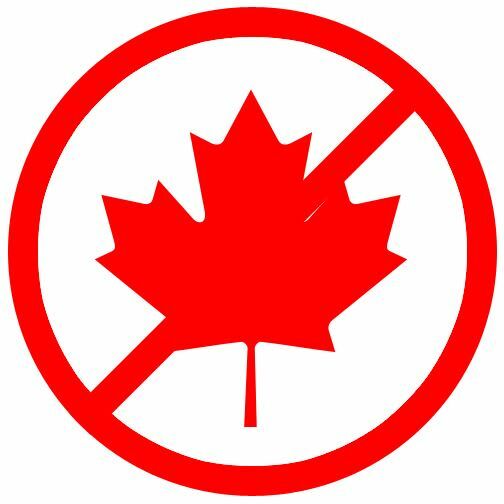 And whether it's because Americans are too stupid to know what cities are in Canada or whether Canadians are too stupid to realize no one cares, the maple leaf logo trend is supremely stupid. 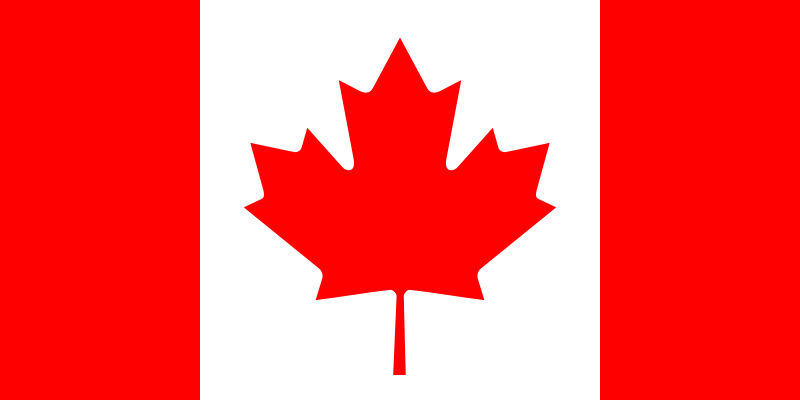 The maple leaf permeates every major sports league in the US and Canada. Hell, even the NFL - a league without a Canadian team - is not immune to this trend. Thanks Bills, how could we tell you were at Rogers Centre (It's Center Canada, but don't get me started...) without that helpful little leaf? The NHL, a league which shouldn't feel the need to do this since Canada has seven teams (Oh, and they created the sport), is one of the worst offenders. Note to Canadian NHL teams: Only one team should have a Maple Leaf in its logo. Yet again, reason is ignored and the leaf is everywhere. At one point, this little gem was an alternate logo for the Ottawa Senators. The newest NHL team, the Winnipeg Jets (a team that already had a leaf-free identity) went the full-leaf and slapped it on every... single... logo they could find. Sure, there identity is based on this, but doesn't this or this accomplish the same feat while evoking the leaf rather than haphazardly placing it in the logo? And did I mention that there's no other red anywhere in Jet's color scheme or on their uniforms? Even the Calgary Flames caved to the trend. After 27 years in Canada, not only did the Flames slap on an Alberta Flag on one shoulder, they threw the Canadian flag on the other - just in case you hadn't realized Calgary was in Alberta, Canada. Even the measly MLS manages to throw in a maple leaf onto one of their two Canadian teams. That one may be the least egregious since the design is so poor, you can barely tell it's a maple leaf, but it is. But the real offender, and probably the originator of the maple leaf trend, is the Toronto Blue Jays organization. Repeatedly and habitually, the Blue Jays (whom you would think would eschew any red for shades of... oh, I don't know... blue?) 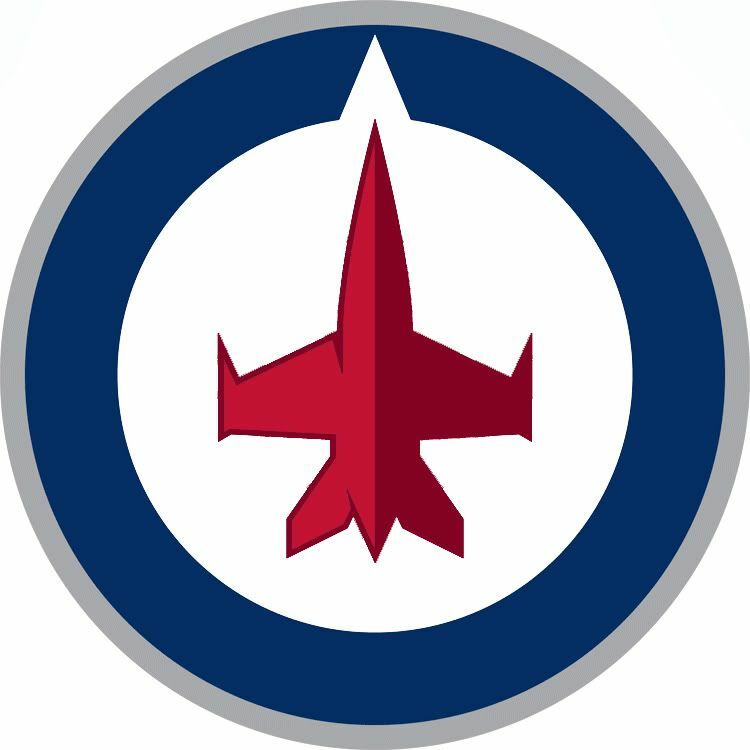 have forced this stupid symbol of, "WE'RE IN CANADA," into every iteration of their team identity since their founding in 1977. Even during the brief period where this was their primary logo and when a variation of that was their cap logo, guess what graced the sleeve of every uniform they wore? That's right. The leaf. So desperate, consistent and ubiquitous has the use of the leaf been in their identity that - I argue - they have corrupted the team identities of almost every sports team in Toronto. Raptors? TR + Leaf alt logo. Toronto FC? Main Crest + Leaf. Even minor league teams have leaf logos. The Maple Leafs get a pass as they existed decades before the Blue Jays, their identity contains no red and their leaf has maintained some design independence from the flag version of the leaf since their inception. But still, Toronto has a leaf problem. ...Canada has a leaf problem, and it's a stupid problem to have. So my humour (<--see what I did there?) may have fallen flat. 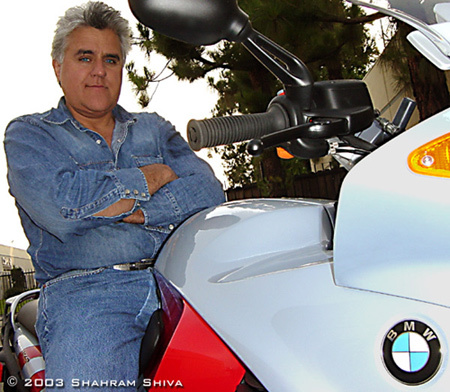 For that I apologize, I'm not a comedian, I'm a writer and a designer. Next time I'll leave the jokes to professionals. I like making Canadian jokes. I refer to this as a Canadian Tuxedo. I like that Canadians say "about" funny. I like that the top of Canadian heads don't attach to the bottom. To me, those are funny jokes, I understand they might not be to Canadians. All jokes aside, my piece was intended as a reaction to the recent unveilings of the Jets and Blue Jays' new uniforms and logos, something that probably got lost in the shuffle. Both have leaves. Both - to me - seem superfluous. I also wanted to note how I thought this trend was bigger than just those two teams. Many Canadian teams in recent history, or currently, in the five major cross/border sports (MLB, MLS, NBA, NHL and NFL, though, they only have the one game in Canada) have had the maple leaf grace their uniform. My argument is that this beats the viewer over the head with, "We're from Canada." People - even Americans - aren't as stupid as we're made to be. 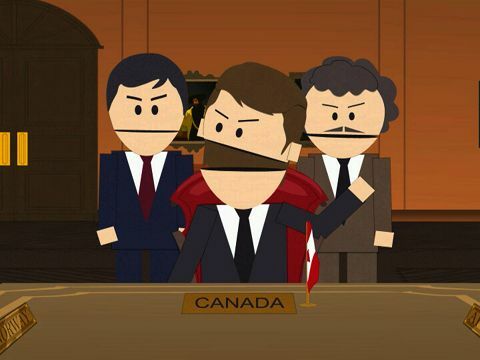 But while discussing this topic, I'm only discussing the trend of the maple leaf, not anything else. If you wish for me to discuss American jingoistic sports trends, you could write a book, or 10, on that topic, without doing it justice, leave alone including the Maple Leaf trend into the conversation. That is what I was taught in school is a topic, not a subject. You narrow the focus of your topics until you find a subject to write about, otherwise there is too much to cover. You don't see articles written in the paper about football, they are on the Dallas Cowboys, and actually, that's probably too broad a topic, most likely it's their playoff chances in light of this weeks' win, or how they match up against their next opponent, etc. While I was trying to talk about a shoelace, some wanted me to talk about an outfit, and that just wasn't what I was here to discuss. I hope people can see why I didn't write about all jingoistic images in sports, it's just too broad to cover in the forum I was trying to do it: I try to keep my essays here right around 1000 words. I picked a narrow topic - my professors would be so proud - and that topic was the maple leaf in Canadian athletic imagery and even that's broadness led me to sort-of take cursory glances at individual teams so that I wouldn't end up writing a 5000 word rant, I figured 1000 was enough, haha. Now, as far as American teams go, there are obnoxious, jingoistic habits and repetitious imagery, but I just didn't feel that was pertinent to the opinion and subject I was trying to write on. I don't know if any of this will change your opinion of me or the piece or why I wrote it. And as callous and self-absorbed as it may sound, I don't care. I know what I wrote, I know why I wrote it and I know my true opinions. Now you all know them too. If that's not enough nothing will be. This isn't my finest work, I'll admit that, but it isn't garbage, in my opinion either, I think there's something to it. Hopefully you'll now see it for what it is, a piece on a trend in Canadian sports design and not a diatribe against all Canadians. 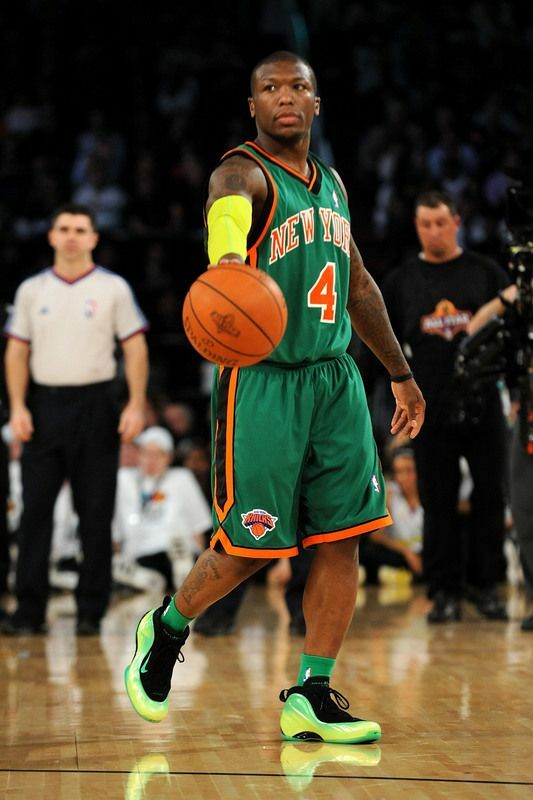 Let me start off by saying that I really like these uniforms. They are a huge improvement over what they have had as of recent (but still aren't as cool as this!). I wish the blue was a little less navy. As predicted by many (including me), the Wizard made it through the recolorization process. With the new Bullets color scheme, the Wiz looks more like Saint Nick and Less like Merlin. He needs to be dropped ASAP. The new 'DC' secondary logo is amazing because of how it echos the old Bullets logo but the font on all the word-marks leaves something to be desired. 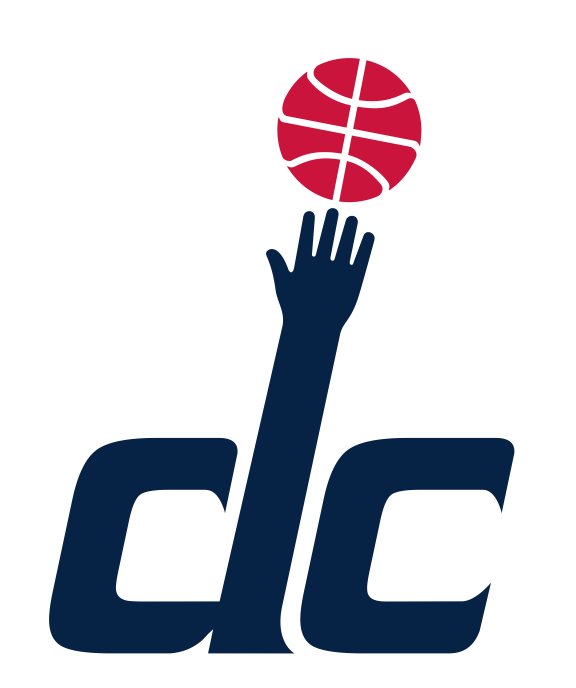 Speaking of the word-marks - The Washington Monument in the H in Washington and the D in Wizards is beyond class. This makes me feel like a complete amateur. Kudos to the genius who worked that into the design. Whoever worked this W into the shorts should get some props too. Very subtle. The Ball/Monument logo is good but I feel like it's a few steps away from greatness. Don't know what the problem is for me but something just feels wrong (maybe it's the seven sided ball). The Home Uni: The number font is less that spectacular and the red tripe should end in a solid line rather than jutting down only near the center logo. 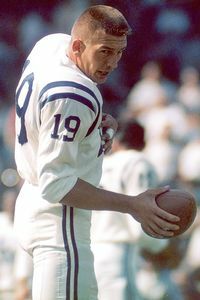 Also, the blue and white on the collar and sleeves should be switched around for better contrast and to match the road uniform. Other than that, pure win. The Road Uni: Same problems as the Home Uni as far as the blue stripe that goes over the shoulders and the number font, but just like the Home Uni, this uniform is a huge improvement for the Wiz. 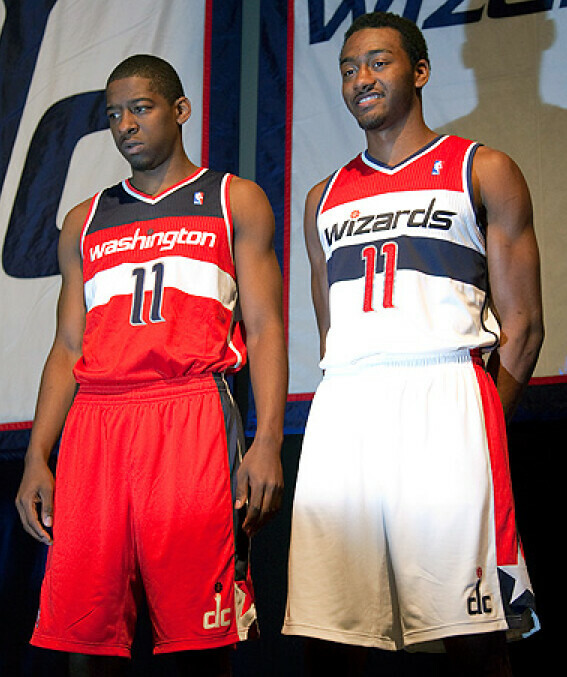 Well, that's my take on the new Wizards jerseys. I wouldnt be surprised if the Wizard logo and name is phased out over the next few years but either way, these new unis are a vast improvement for this franchise. Until then, you know what to do. I've been gone for a week, miss me? The other day, I was inventorying some of my graphic design and sports concept works when I stumbled upon this. 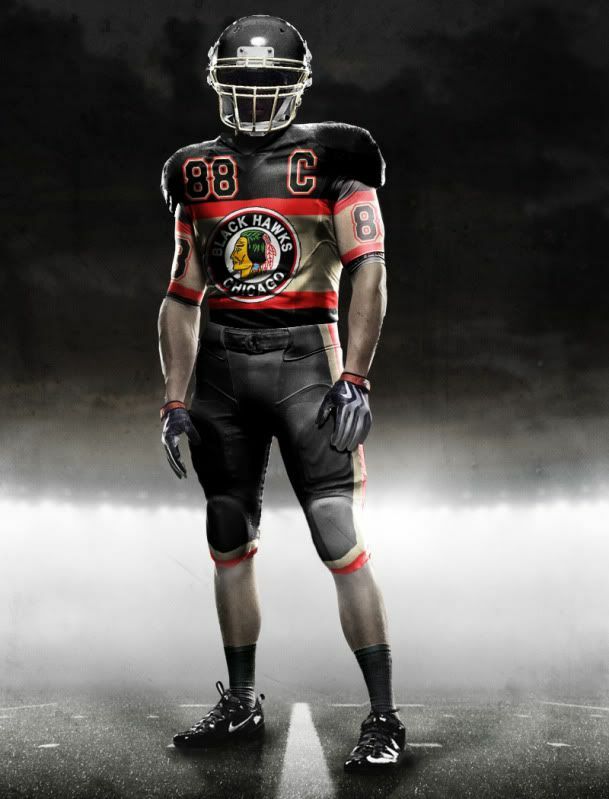 That Chicago Blackhawks football uni predates all my IU concepts, my NFL concepts and my NBA Concepts. That was one of the first designs I ever did using the Nike Pro Combat template (Though I'm not quite sure why I gave Pat Kane the Captain's C, why not just put #19?). 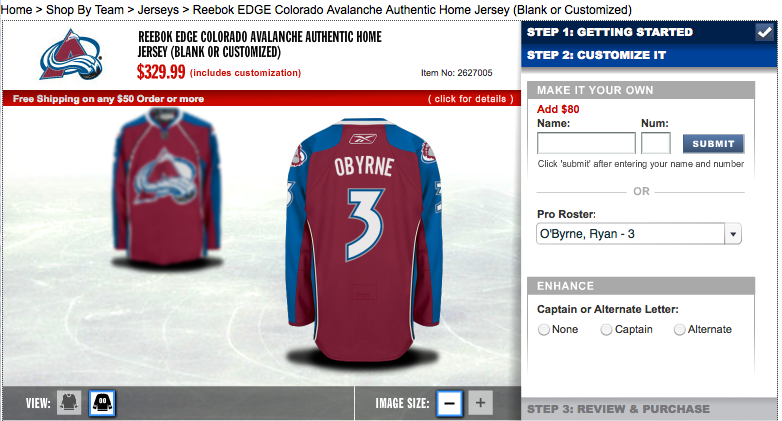 When I was reminiscing about my early uni-tweak days, I came across the page of Majestic NHL baseball jerseys. 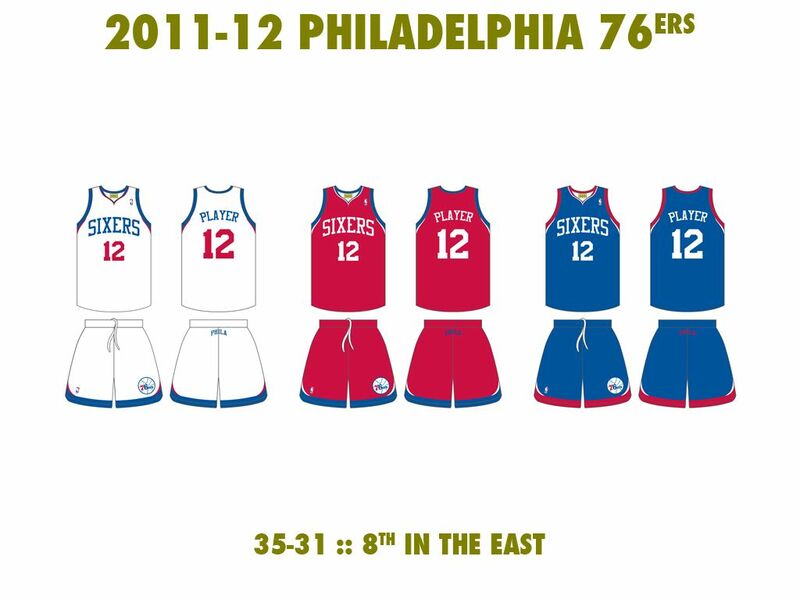 Well, and idea immediately came to mind: What If I redesigned teams' uniforms to fit other sports' jerseys? I decided to switch around all of Chicago's major sports teams (sorry Fire). My Rules were basic, first, I arbitrarily started but whatever uniform template I dealt with (i.e. 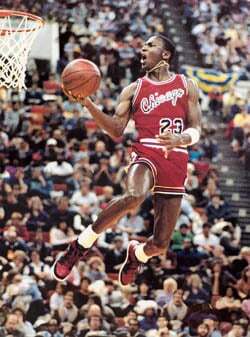 basketball), that Chicago team (i.e. the Bulls) would be the next design I would do. This will become clearer soon. 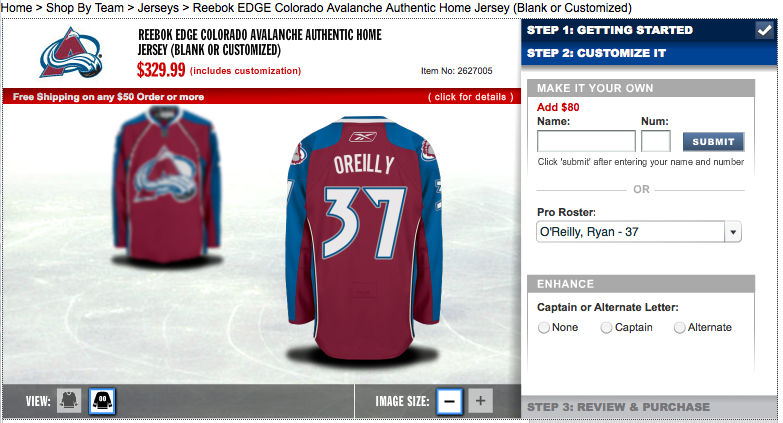 The design change fits the template's sport better than a copy/paste version of the uniform. Some look better than others - much better - but I think this is a fun idea to play around with uniform design. Bears in the NHL - Home and Road - This quickly turned into my favorite design. 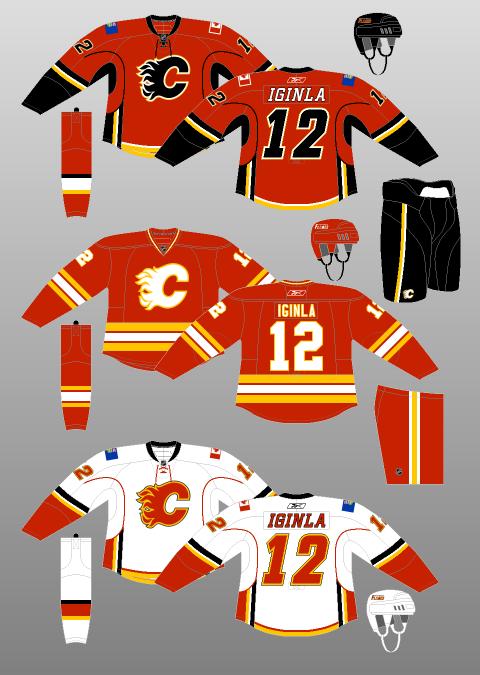 Old football uniforms and modern NHL uniforms actually have similar cuts. Hell, they look closer than old NFL unis and current NFL unis do. 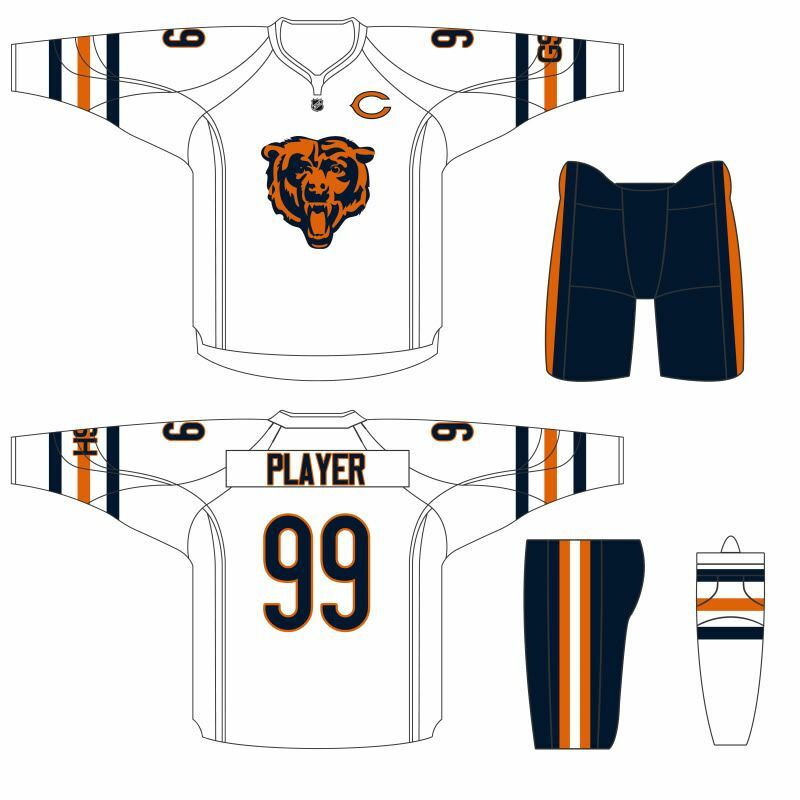 I decided to put the Bear's head logo on the front of the uni to go with the hockey theme but also because it's a great but underutilized logo. 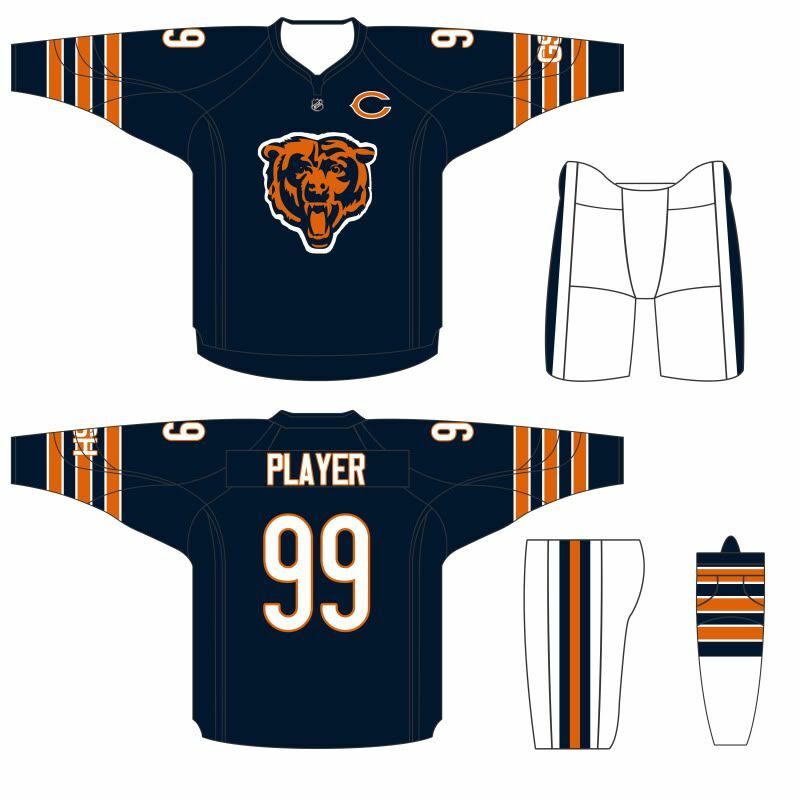 The Bears' 'C' makes a perfect captaincy patch. Blackhawks in the NBA - Home and Road - I decided to put the Hawks in the NBA this time since I had already created NFL unis a while back. 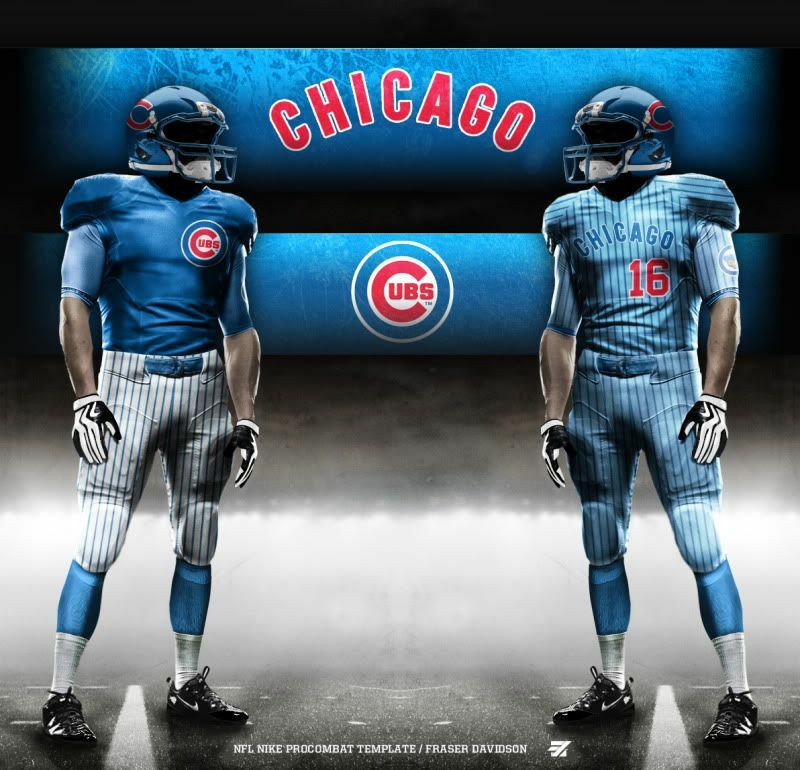 In contrast to the Bears in the NFL, I think these concepts are probably the worst in the bunch. 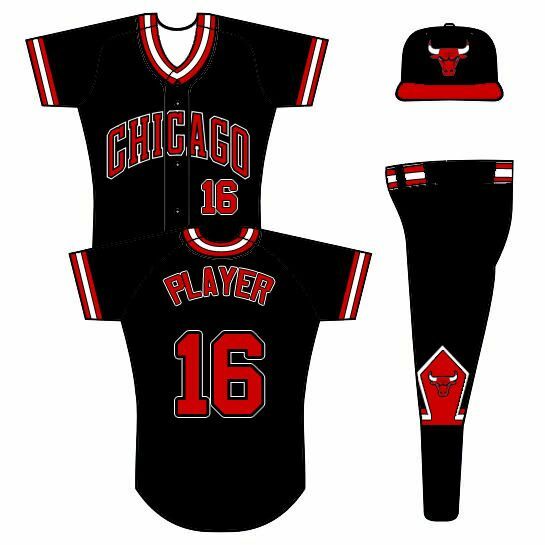 Bulls in the MLB - Home, Road and Alternate - These I think you'll either love or loath. Now the only real change to the Bulls uniform design is the that front number is moved off-center to fit better with the MLB template. 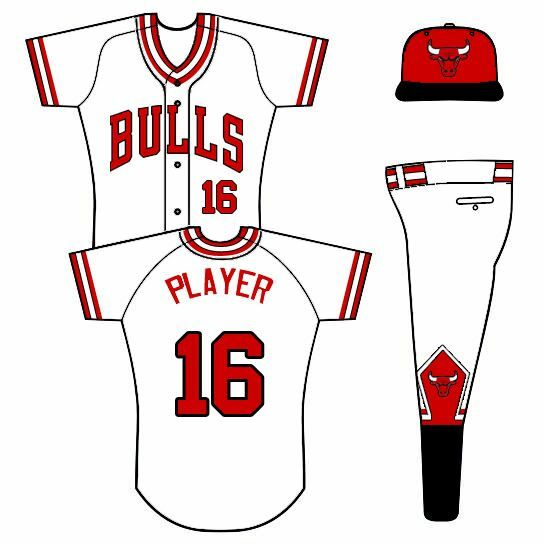 The Bulls' unis actually used to feature off-center front numbers, so it's not even unheard of. No road grays for obvious reasons and solid color road and alternates may make some baseball purists ill but you could always mix and match pants and jerseys. And with the Bulls playing in the MLB, maybe they bring back the pinstripes. Cubs in the NFL - Home and Road and Alternates. With both Chicago baseball teams, they really only have three jerseys (home and road pants under the same colored top do not make two alternates) so with the Cubs a brought back the old Blue on Blue pinstripes as a road alternate option. I also brought back an old 'CHICAGO' font and the old Cub's head logo is on all the left sleeves. 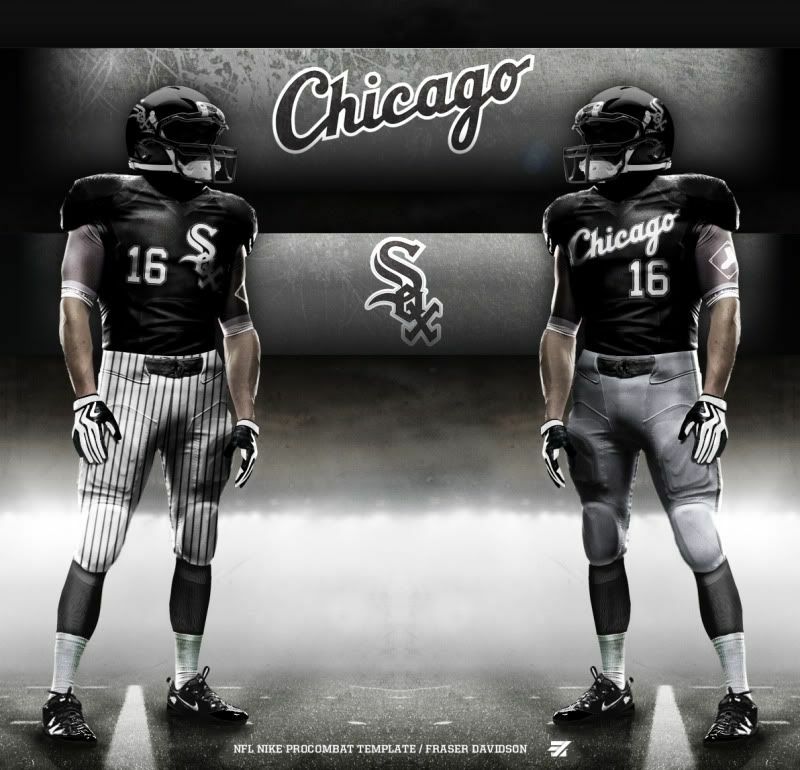 White Sox in the NFL - Home and Road and Alternates. 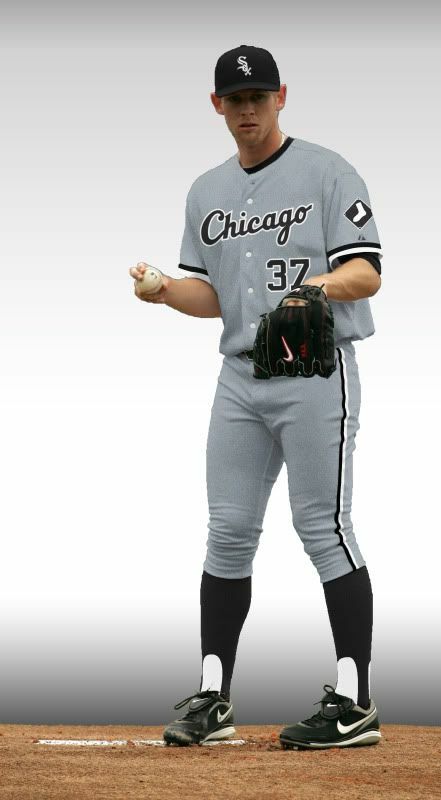 Now I cannot claim this idea as my own, but having two black alternates, one base on the home jersey and the other on the road jersey, is a great way for the Sox to diversify their uniforms (they wear their current black alt for most home and road games - it's getting a bit old). The thing I liked most about doing these baseball uniforms for a football template was how it shows that a football uniform doesn't just need to be a uni number and that's it. 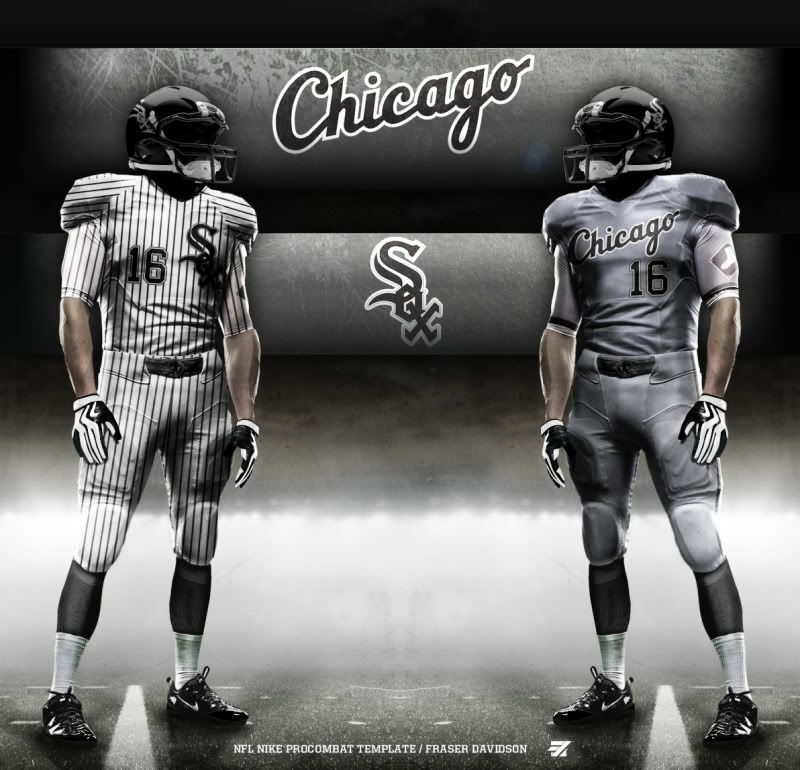 I don't think I'd recomend pinstripes anytime soon but this shows that there's room for design change in football. Well, that's all for today. As always, I hope you enjoy something and feel free to leave comments or questions.